The federal government has rescued Oklahoma once again after a string of weather disasters, but don’t think Republicans here will tone down their anti-federal government rhetoric anytime soon. On Friday, government leaders announced the federal government was giving nearly $37 million to the city of Moore and the state of Oklahoma for recovery efforts after the tornadoes and storms that struck from May 18 to June 2. The time period includes the May 20 tornado that struck Moore, killing 23 people. The money is coming from the U.S. Housing and Urban Development Community Block Grant Program. Moore will receive $26.3 million; the state will receive $10.6 million. There’s no question that the money is desperately needed, and Republican leaders, including Gov. 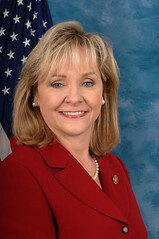 Mary Fallin, expressed their gratitude, but the state’s continued dependence on the federal government and taxpayers from other states undercuts their states’ rights and anti-government stances. What kind of place would Oklahoma be if the federal government didn’t bail it out time and time again? I’ve written about this issue for years. Even as Republicans file lawsuits against the federal government and wave “Don’t Tread On Me” flags honoring the ideology of the Tea Party-Fallin did so at least once-they’re sticking out their hands for government money. They don’t even see the contradiction. The May storms cost the lives of dozens of Oklahomans and over $1 billion in property damage. We are steadily rebuilding, but many families are still struggling to get back on their feet. The disaster relief grants provided by HUD – along with continued work from state and local governments and non-profits – will make a big difference in the lives of those affected by this year’s tornadoes. Of course, Fallin would also want you to know she continues to “fight federal overreach” and “protect constitutional liberties.” She also thinks Washington can learn a lot from Oklahoma? What exactly? How to beg for money after a weather disaster? While there were numerous communities affected, my hometown of Moore saw the most widespread damage and the rebuilding efforts ahead are understandably more challenging there. I am pleased by the generous grant provided by HUD to help our city restore lost homes and businesses but also repair broken infrastructure. Of course, this comes from the same person who proudly says he has voted against Obamacare 40 times. That’s a badge of honor to him, not a sign of futile desperation. The point here is that most Oklahoma Republican leaders manipulate people here into thinking there’s vast federal intrusion when, in fact, the state relies heavily on the federal government for its own viability, from employment at military bases to direct health care funding to disaster relief. It might be fun to bite the hand that feeds you, but it’s also a contradiction and blatant hypocrisy. I quoted Fallin’s statement that the money “will make a big difference” and Cole’s statement that the money is a “generous grant” because the language can be seen as normal gratitude. Let’s hope they remind themselves of this reasonableness before they go on their next anti-federal government tirade.